Hot dog! Two surprises on a snowy winter Monday. The first is the new header. See it? It just went up this morning. Go ahead, press your nose against the monitor — it still has the new header smell. So what do you think? I did two executions and couldn’t decide between them, dithering back and forth all day. I like the other one, but it looks, I don’t know, elegant or something. No, not elegant, kicky? Ladylike? The point is, I’m none of those things. And I don’t want to give people the wrong impression. They’d expect stylish and trendy and find … um, this. There’d be a nasty backlash, ladies and gentlemen. Name calling, angry comments, scorn. So I went with the loopy one to be safe; I can live up to loopy. Blindfolded and one arm tied behind my back. Did I make the right choice or is the polished appearance a refreshing change? I admit, I prefer the hypnotizing affect of the concentric rings. The dizziness makes me woozy, light-headed. Then again, the woman in profile is lovely, very Audrey Hepburn. And, you know, we do share a similar hair color, Audrey and I, but the likeness ends there. Crap, I should just start over, shouldn’t I? They’re both embarrassing. I am such an amateur. Let’s move on, all right? Here’s surprise two: Tom Hanks. Using the subway. In New York. How can you not love the guy? 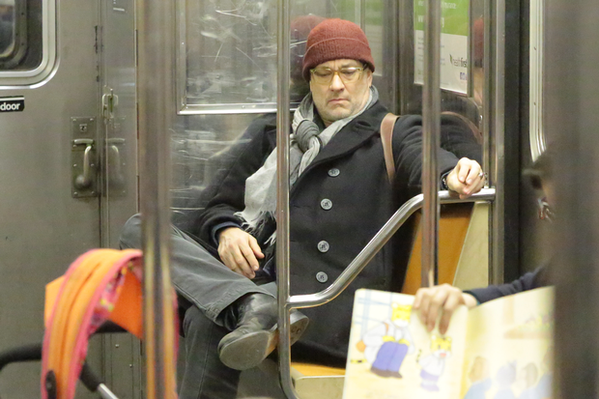 He has ten zillion dollars and he schleps around Manhattan on the subway. Admirable certainly, but notice he’s taking up two seats — the dreaded manspreading is verboten. Whoopsie. Pffft, who cares? It’s Tom Hanks. On the damn subway like the rest of us. I’d take the limo, myself. Love the new design, and WOWSA-is that really Tom Hanks? Too cool! You do, really? Now I think I like the other version. I swear to God, I’m a waffler. I’m so relieved! I love things until the instant they’re posted and then I second-, third-, and fourth-guess myself. Thank you for the vote of confidence. You’re the best!!! You’ve chosen the right alternative. Looks cool. Except I was hypnotised for the first ten minutes and then the cat jumped onto my head. For some reason the header is just a ? on my screen. Is it me? It’s probably me. Different, not awesome. I was bored with the old header and decided to freshen up the place. Granted, it’s a small change, but big ones are disorienting. It shows up correctly on my monitor and on my phone. I’ve not heard of a problem from others, but I’ll go check on another computer. Maybe it will resolve itself in the meantime? Let me know, I’m worried. Problem solved. It was probably at my end due to Juno. The blizzard, not the Canadian music awards. It’s hard to choose between the two. I think I do like the alternate more, though. But it’s probably a matter of personal taste. Between the two of us, I’d have taken the limo too. Public transportation is starting to make me upset and frustrated, with all the people pushing in/out or just leaning on you, because…why not. But enough with my unpleasant mornings to work. The new header looks great! Thanks, idealist. I think I’ve decided to rotate the two versions every month or so. Well, that’s what I think today; tomorrow will be a different story. Public transportation is definitely a frustration. But so is driving, with all the tailgaters and people cutting you off and sitting through stoplights while they text. I don’t know which is worse. Maybe I should start walking. Personally, I like them both but I think you made the right choice. The red ring thingy is totally you. It is most definitely a compliment of the highest caliber. I don’t know how this got lost, but it did. It is Forrest Gump — his posture’s gone to Hell, though. Thanks and will do,cheesefeed!